by Neil Havlik | When several proposals for solar power facilities in the Carrizo Plain area of eastern San Luis Obispo County, California, became publicly known in 2009, those proposals raised many questions. How big would they be? How would they be managed? What would be the environmental and social impacts of their creation? Would they be a benefit to the community or a detriment? It took several years of investigation, research, and public debate to begin to answer these questions. At that time the author served as a member of an citizen’s advisory group for Carrizo Plain National Monument. The Carrizo Plain had over the years attracted a dedicated group of volunteers and activists who were fiercely protective of the Monument and its natural and cultural resources. The solar proposals (known as Topaz Solar Farm and California Valley Solar Ranch) were the subject of considerable debate and discussion within the advisory group, but in the end the group determined that it would not enter into the public discussion of the project. The author also made the personal decision to stay out of the approval process, knowing that many others, including several influential environmental groups, were ready to take on that effort. Thus when I had the opportunity in 2013 to get involved in the Carrizo Plain area outside of the Monument, (1) I had only a general idea of the outcome of the public approval process, and (2) I was pleasantly surprised to see that what I had imagined as the outcome was quite mistaken. Overall, in the view of this one observer, the solar facilities have been a significant benefit to the Carrizo Plain. The public debate over the solar facilities was lively and lengthy. It included the imposition of more than 125 conditions of approval, ranging from environmental mitigations to bus-pooling for workers (more than 1,000 at the peak of construction) to reduce impacts on traffic. Many of the environmental conditions were enhanced by the settlement of litigation that followed the County’s approval of the projects. The result has been the creation of a second cohort of conserved lands second only in size to Carrizo Plain National Monument itself, together with renewed interest in continued expansion of those lands. This is explained more fully below. The visual impacts were considerably less than feared. I had imagined fifteen square miles of solar panels lined up side by side, with heavy use of soil sterilants and herbicides to control weeds. In short, it could have been a biological wasteland. But this was not the reality. 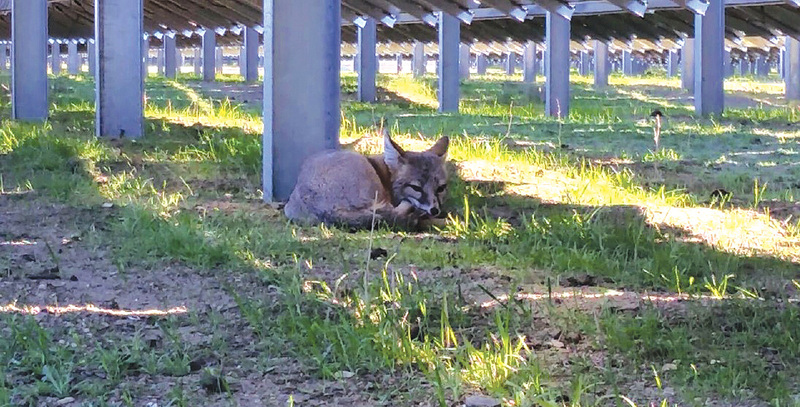 The solar facilities were arranged in arrays of irregular shape, and separated by wildlife movement corridors of varying sizes, all of which served to reduce their visual impact. By agreement with the environmental organizations, the solar facilities do not use pesticides within the arrays or wildlife corridors. Biological impacts to the local environment were one of the most significant issues in the approval process. There are several federally listed endangered species in the project area, as well as several other important species of concern, including pronghorn and tule elk. Extensive research into the needs of these species was conducted and modifications to the project’s layout occurred as a result of the findings of that research. And this was just within the actual project area. The solar companies agreed to purchase a large acreage of land for habitat mitigation purposes and commit those lands to permanent conservation, including sizable endowments to support their long-term management. In the end, over 30,000 acres of ranch and dry-farmed lands were purchased by the solar companies and transfered either to the California Department of Fish and Wildlife or to local land trusts. The result has been the establishment of an entirely new conservation complex in the northern Carrizo Plain area. There is considerable interest in the expansion and consolidation of these lands and in their ultimate connection to Carrizo Plain National Monument several miles to the south. Other significant efforts have included research into the historical vegetation of the area, which had been greatly altered by years of dry farming. The findings of this research suggest that the Carrizo Plain was an open scrubland with native grasses, both annual and perennial, among the scattered shrubs. Because of disking and other farming operations, the shrubs have mostly disappeared from the valley floor. Efforts to restore a semblance of this original vegetation are getting underway. The recent years of drought have not helped this effort, but these efforts will continue, using a mix of as many as a dozen native shrub species, and several native grasses and wildflowers. Livestock grazing will continue on the conservation lands as a vegetation management tool only, not as ordinary commercial leasing of grazing privileges. Timing, number of animals, and distribution will play important roles in using livestock (both cattle and sheep) as an effective management tool. Agriculture will even continue within the array areas. The panels provide shade, and grass and wildflowers are doing well underneath them. So to manage the amount of growth for fire safety purposes, sheep are brought in to graze off the plants in the mid- to late spring. Electrical conduits are rodent-proof and thus rodents such as gophers, ground squirrels, and even the endangered giant kangaroo rat can be allowed to re-colonize the array areas. This shows the wisdom of the no pesticide agreement; raptors such as hawks and owls, and predators such as coyote, bobcats, and the endangered San Joaquin kit fox have continued to thrive in and around the arrays. As a protection for the kit foxes, the fencing around the arrays is designed so that the kit foxes can get through them but the larger coyotes and bobcats cannot. This has worked well, and several kit foxes are known to have taken up residence within the array areas. Miles of pronghorn-friendly fencing has replaced standard barbed wire along Highway 58 and many property and pasture boundaries. Pronghorn and other wildlife have also benefitted from the installation of numerous wildlife water troughs, providing good sources of water throughout much of the area. The eventual establishment of a shrub component to vegetation in the mitigation areas will aid in pronghorn calf survival by making the calves harder to been seen by possible predators; the openness of the ground has been a major problem affecting reproductive success of pronghorn in the area. I believe that the advent of the solar facilities on the Carrizo Plain has been beneficial on the whole. Do I wish they could have been located somewhere else? As one who loves the wildness of the Carrizo, of course I do. But as the world moves forward toward more renewable energy, the Carrizo solar plants are making an important contribution. They are here to stay for at least the next thirty-five to forty years. I attribute most of the success of the Carrizo Plain efforts to the vegetation of recent years, which is grassland. This area is on the lower edge of the rainfall spectrum suitable for grassland; four to six inches per year is normal, and the grasses are short, as is the actual growing season. Occasionally there is a wet year (like the current one) and the grasses may be several feet tall, but that is only occasional. The grassland is also largely annual; the native perennials having been diminished by the regular plowing, disking, and harvesting that went on for many years. The decision to avoid pesticide use and to tolerate a grass cover beneath the solar panels has resulted in the establishment of a new grassland, with more native species and without the heavy disturbance of the past. It has also allowed for reestablishment of a native fauna, primarily of rodents, which are the base of the food chain for larger mammals and birds. In the desert, the primary vegetation is shrubs, which are large and usually cannot be tolerated in array areas. Thus large areas of shrublands are often cleared and destroyed to make way for solar facilities. In the Carrizo Plain, which had already been converted to grasslands or farming lands, the solar arrays are leading a return to more natural growing conditions, even including the restoration of a shrub component to the vegetation. While the initial indications are very positive, it remains to be seen how these efforts will ultimately turn out. The solar companies are required to fund continued research on the endangered species for several more years, and it is hoped that that information will be able to guide further efforts once the initial monitoring and reporting obligations are completed. The north Carrizo Plain is now a giant experiment in restoration, and one which everyone hopes will be successful. Neil Havlik, PhD., is the former Natural Resources Manager (now retired) for the City of San Luis Obispo, which position he held for seventeen years. A graduate of Cal Poly, Neil earned his doctorate at UC Berkeley in 1984. He served on the Monument Advisory Committee for Carrizo Plain National Monument for ten years and is currently the president of a land trust known as the Carrizo Plain Conservancy.